Are you planning to improve your life? Buy the best air fryer and cooking healthy food will be a breeze! As I get older, I am more and more health-conscious. Cooking is an integral part of my decision to improve my habits and the quality of my life in general. In fact, as soon as I have become a parent my desire to cook healthy food skyrocketed into the unknown heights. I used to eat a lot of fried food, and that stopped as soon as I became a mom. When my girls were little, I had complete control over what they were going to eat for every single meal. My choices were always healthy foods: veggies, fruit and white meat or fish. As they grew, they have started making their own choices and, as you can probably guess, they had nothing to do with healthy food. Whenever I was not around, they enjoyed unhealthy snacks, fast food and, of course, fried foods. I cannot say that I blame them; fried food is pretty darn delicious. I do worry though, as fatty grease is not only a potential health hazard but can also be a ticket to obesity. You can thus understand my sense of relief upon discovering a miracle called the air fryer. The air fryer enables you to fry your favorite food without drenching it in oil. It sounds great to be able to enjoy the crisp exterior without the grease dripping down your chin, doesn't it? Want to find the best air fryer? Read on and you will. Are there any reasons not to buy the air fryer? How Does the Air Fryer Function? 1. Do you need to use oil? 2. What can be cooked in the air fryer? If something can help you improve your health, or stay fit, you should not ask for anything more am I right? However, there is more to air fryers, so why not mention it. The hot air that circulates inside the air fryer will cook your food much faster than any oven could ever do. Your favorite food will be ready at a fraction of the time, and that will leave you with more time to spend with your loved ones, relax, or exercise and burn those calories you have just eaten. Less time to prepare food equals less energy spent and that results in a reduced electricity bill. However, that's not all; less oil spent also means more money in your pocket. Besides, the air fryer will not heat the entire kitchen like a conventional oven so there will not be as much need to turn on your air conditioner. The best air fryers feature automatic shut off function for safety reasons. The heating elements are always hidden which makes these units even safer. If your children are about ready to cook on their own, air fryers are a good starting point as there's almost no chance that they can get hurt or cause some accident. First of all, these units are not suitable for cooking large amounts of food. An average air fryer holds only one or two servings. People with high expectations should also think twice. If you expect your food to taste exactly like deep fried you are bound to end up disappointed. The food cooked in air fryer resembles most to that prepared in the conventional oven. An air fryer utilizes the moisture from your food and creates a sort of heated mist all thanks to the superheated airflow. The chamber then becomes extra-hot while the dry heat penetrates the food from the outside. The result: crispy crust on the outside while the inside retains the soft texture. You should remember one thing though: Never overload the air fryer's basket or you will not only slow down the cooking process but also prevent the air from reaching all the food, and you will get uneven results and soggy food. Air fryers do not need oil in order to work, but a teaspoon or two can improve both the texture and flavor of the food. If you are worried about the calorie intake, don't be. One teaspoon of oil has only 40 calories, and it is not too high a price to pay if you consider how greatly you will improve the taste and texture of your air fried food. This small amount of oil will brown the surface of your food and make it extra crispy. Almost every food that can be prepared in your oven or your deep fryer can be cooked in the air fryer as well. Air fryer does not serve to replicate just your traditionally-fried food; you can use it for baking or roasting as well. I personally adore fish prepared in the air fryer - it is done in minutes and tastes divine! I know that most of you are eager to find out how the air fried French fries turn out. The results are great, and fries are as crispy as the ones fried in oil. I also make homemade air-fryer veggie chips as well as sweet potato and even sweet apple chips. My kids really enjoy the process and these healthy snacks too. Air fryers are quite useful when it comes to desserts too - I made doughnuts, and they disappeared more quickly than it took me to make them! I do not have anything against the good old reliable analog dials as they are very easy and intuitive to use when setting the desired cooking temperatures. However, most modern homemakers and cooks prefer digital dials and displays. Analog dials can sometimes be accidentally shifted when we open or close the air fryer while the digital dial requires you to confirm the change of temperature and eliminates the possibility of error. Air fryers are by definition big, often more massive than a full-size food processor. However, certain models truly overdid it and will require almost a whole counter’s worth of space. Hack, some unit are so high too that you will not be able to lift their lid without banging into your kitchen cabinet. Unfortunately, size often does not have anything to do with the capacity of these units, and thus I give my vote to short and slim, elegant looking models that will leave enough room on my counter to do my magic!. If you want to avoid the cabinet bumping lid problem I have mentioned, go for the drawer style air fryer. Such models feature a front-facing basket that you can pull out like a drawer which is very convenient. Drawer‑style models also tend to take up less space and are far safer as flip-top air fryers usually have a heating element in the lid and you can accidentally burn yourself. You surely do not want to buy a machine that is hard to clean so make sure that the basket has a non-stick surface rather than the mesh metal one. You should also avoid an array of different attachments that you do not really need. The GoWISE USA GW22621 air fryer is a modern looking unit that features a top-notch touch screen which enables you to manually program cooking time and then sit back and relax until your food is done. This air fryer measures exactly 12in x 8in x 8in. It is very safe to use as it is a drawer-type and all the heat elements are well hidden - even your kids can give it a try! You can adjust the temperature from 175°F - 400°F while the timer allows you to set time to up to 30 minutes. It all makes this unit quite versatile. If you are not sure how to set the unit you can rely on seven built-in smart programs (Chips, Chicken, Meat, Steak, Shrimp and Fish) or a small cookbook that comes with the unit. The basket is easy to remove, and there is also a button guard that will prevent its accidental detachment. The basket is covered with non-stick material which makes it easy to clean. You can even place it in your dishwasher. The basket has holes at the bottom, so make sure that you insert the GoWISE baking pan, any other oven-safe baking pan that fits, or at least some aluminum foil to prevent dripping and save you from cleaning the mess. 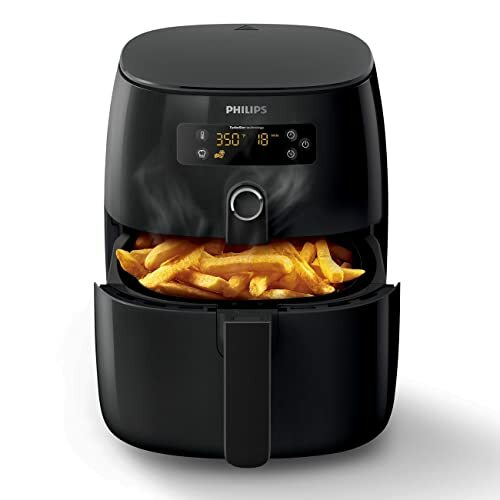 The Philips HD9641/96 TurboStar air fryer is an excellent choice if you do not mind spending some serious money. The unique TurboStar technology really delivers when it comes to healthier cooking, and the food comes out truly tasty. The unit features an intuitive, quick control dial and a digital display as well as five presets to cook the most sought of dishes such as French fries. An app provides you with more than 200 recipes to use as well. It has an option to keep your food warm for up to half an hour too. The dimensions of this drawer type air fryer are 14.4 x 10.5 x 11.3 inches, and it holds up to 1.8 lbs. It is therefore not suitable for large families unless you are used to preparing food in small batches. The good news is that there is no need to preheat the unit and that you will be able to clean it in under two minutes - that means more time for you! Both the non-stick drawer and the food basket are dishwasher safe, but you can use baking paper or aluminum foil in your Philips Air fryer too - just make sure not to cover the basket bottom completely. Philips HD9641/96 TurboStar air fryer has one fault though - you can always add time to the timer, but it can never be turned back. If you make a mistake, you will have to wait for that time to pass and then start over as there is no safety shut off if you remove the drawer before the time expires. This air fryer comes from the renowned house of Ninja and provides excellent cooking results no matter whether you air fry, bake, roast or reheat the food. It even has a dehydrating function which I especially like as I had a desire to buy a dehydrator for quite some time (now I don't have to). This unit offers a wide-ranging temperature range 105°F (in Dehydrate) to 400°F (in Air Fry) and a mid-range capacity of four quarts. This means that you can prepare about 2 lbs. of your favorite food. The one-touch control panel offers four programmable cooking functions while you can use the manual controls to set the cooking time and temperature. The basket is ceramic coated so that no food will stick to it and it will be easy to clean too. The exterior is made from BPA-free and FDA-certified food-safe plastic. The basket handle stays cool to touch but the body warms up quite a bit so make sure you do not burn yourself. The unit is reasonably priced and comes with a one-year limited warranty as well as the crisper plate, and a multi-layer rack. If you have a big family like me and you need to cook large amounts of food every single day, Tidylife 1855A air fryer might be right up your alley. It is the biggest air fryer I have tested - a true family size with a capacity of 6.3 quarts. The actual measures of this unit are 11.6 x 10.7 x 9.8 inches, and the diameter of the pan is 24cm. All this means that you can cook a whole chicken at once and organize a family gathering with minimal effort! In my opinion, this air fryer can feed up to eight people. 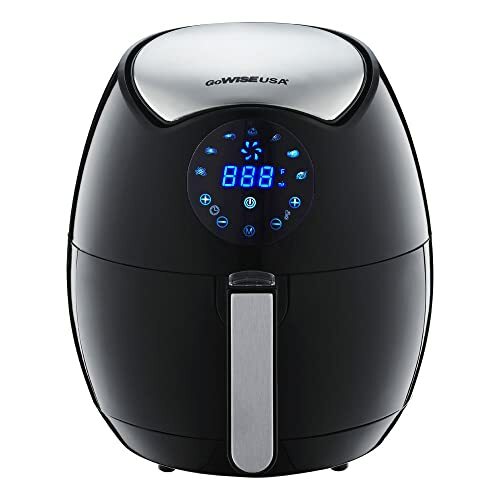 This unit is labeled as 8 in 1 air fryer, and that means that it cannot only air fry, but can also replace your oven, grill, microwave, frying pan, and sandwich and popcorn, maker. You receive a recipe book that will help you master all these functions too. This powerful 1700W machine allows you to cook in half the time you would typically have to invest. You will save time on cleaning also as the basket is non-stick and dish-washable. All the heating elements are well hidden behind the detachable drawer, but there are additional safety features such as the automatic power off function, non-slip feet, and safe hot-proof handles. Safety release buttons are also there to prevent accidental separation of baskets and frames. The digital controls and the screen can be a bit difficult to master at first, but it all becomes clear after a few uses. If you experience any issues, you can rely on 90 days of free exchange service and 18-month warranty. 90-day free exchange service, 18-month warranty and lifetime technical support. 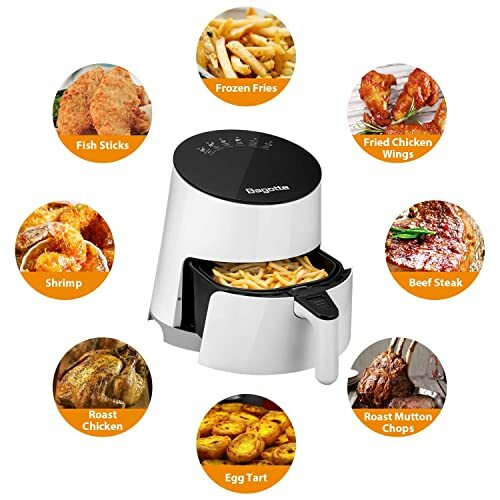 Bagotte air fryer is yet another reasonably priced modern looking air fryer that will help you lead a healthier life. The instructions are self-explanatory, and the digital touch screen is thus super easy to use. There are six presets for the most popular foods such as French fries, chicken nuggets, fish or poultry. In fact, you can cook most of your fav fried, baked, grilled, or roasted dishes with as much as 80% less fat. The unit has a capacity of 3.7 quarts which limits you to cooking for up to 3 people. The temperature ranges from 180℉ to 380℉ and the time can be set to anywhere from 0 to 60 minutes. You can clean the non stick basket easily - all you need is some soap and water - everything comes off quickly. The basket is also dishwasher safe for added convenience. If any problems occur, you can rely on both one year warranty and lifelong service. The unit is definitely worth buying as the food turns out really tasty, but it is not without any faults. First of all, it is not suitable for the family as big as mine, but there are also some minor designer faults. For example, it misses a handle for easy and safe moving. The beeping sound that notifies you that your food is ready is too loud as well. 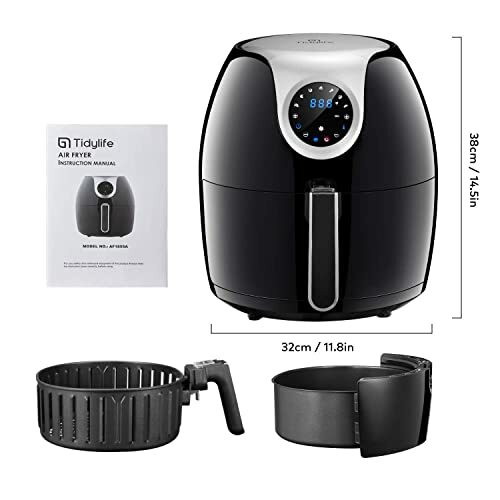 TidyLife 1855A air fryer is my favorite for the most obvious reason - it can feed my entire family at once! However, the benefits of this unit do not end there - the unit is the safest I have tested so far and offers the best customer support too. 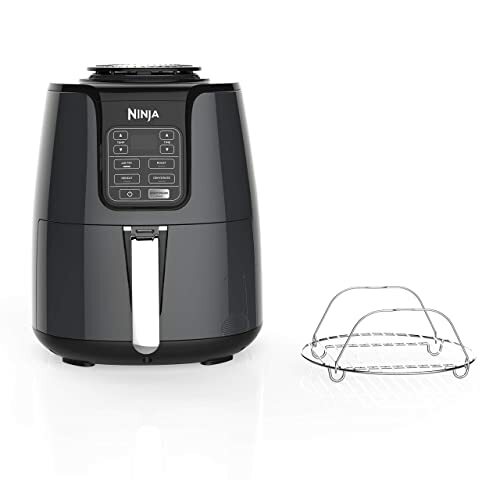 All the units I have reviewed are great though, and if I had to set out another one it would be the Ninja air fryer due to the dehydrating function that has been on my wishlist for ages! Buying this unit would be like killing two birds with one stone, if only it were a bit bigger! No matter what your choice will be, the air fryer will enable you to enjoy your favorite treats more healthily. It has proven to be a hit in my family so hurry up and get one too!